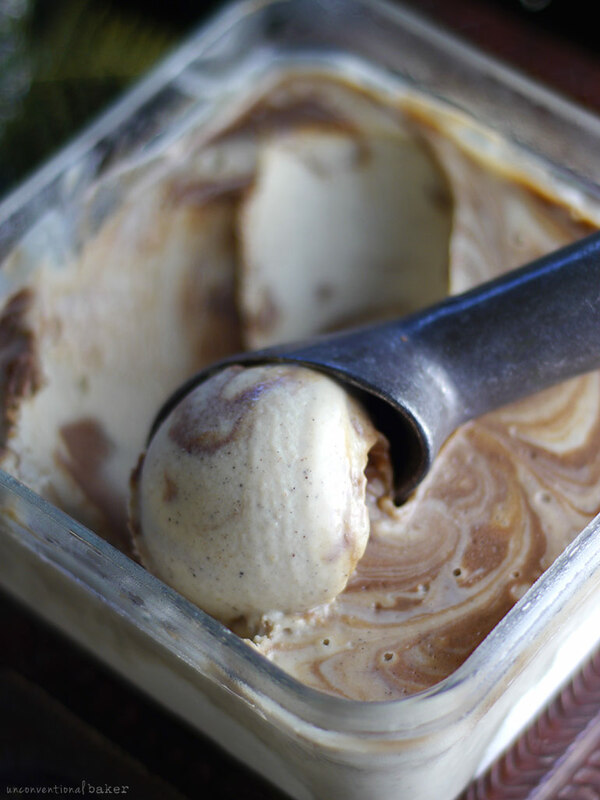 So you may already know that there’s a most delicious caramel swirl ice cream recipe kicking around on the blog already… one that is probably in my top favorite ice creams ever. Do you think that would stop me from making another caramel swirl ice cream recipe? Ha, not in a million years! And it’s the easiest thing to throw together. Soak nuts, blend everything, wait for it to set (that’s the hard part), and then try not to eat it all at once (that’s the other hard part ??). 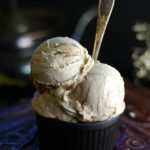 Delicious, creamy vegan vanilla ice cream (no churn), with a salted caramel swirl. No cooking required for the caramel! Refined sugar-free. Make sure all ingredients are at room temp. Blend all ice cream base ingredients into a smooth consistency in a high speed blender. Transfer this mixture into a glass tupperware container. Return ½ a cup of that mixture back into the blender. Add caramel swirl ingredients and blend once again to create the caramel. 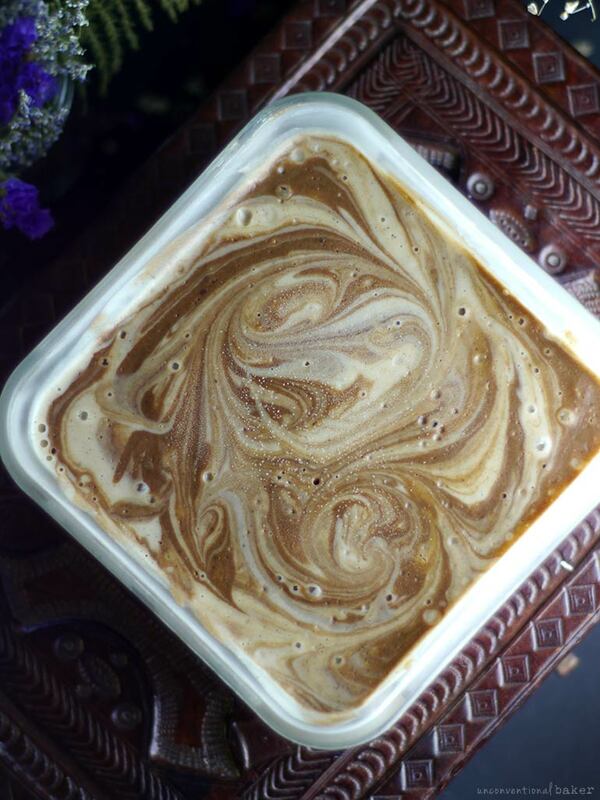 Swirl this caramel mixture into the ice cream base in the container (be careful not to over-swirl so you don’t just blend it all into one flavor). Freeze for 5-6 hours to set (or overnight). Thaw out a touch, scoop and enjoy! First of all, thanks for sharing this recipe. So, I made this today, and finally had the chance to taste it. One thing I may change when I make this again (and I will definitely be making this again and again) is to omit the tapioca flour, or figure out a way to remove the floury taste. I think, maybe by cooking it with liquid prior to adding it with the rest of the ingredients? I’m not sure, but I will give it a try. Otherwise this recipe is a keeper. You could just omit the tapioca altogether if you prefer. It helps it not be as icy, but it’s not a deal-breaker. Would soaked almonds without their skins work for the cashews?? I can’t have cashews and it can be a bummer when they are in nearly every raw or vegan recipe!! :) I usually sub for macadamia, Brazil nuts or almonds depending on the recipe but just wanted your recommendation first! Hey Kass, I hear ya. I’ve been trying to do some cashew-free options for that reason (though I do love them personally). Another nut, like blanched almonds or macadamia would work, but the texture will be a touch different (I find cashews cream more smoothly) and also you’ll need to add more sweetness (as cashews are naturally a lot sweeter) — so just adjust that to taste. Hi…Can I use Xanthan Gum in place of the tapioca flour? If so, is it a 1 to 1 exchange OR do I need to use more/less? Hi Rachael. No, guar gum wouldn’t be a good way to go here as it serves a completely different function and acts differently to tapioca. 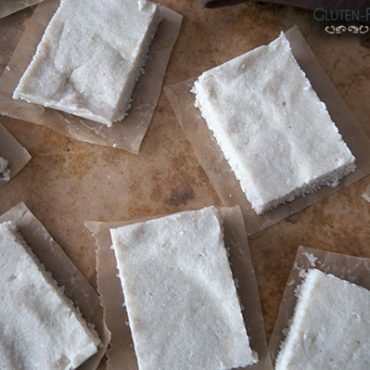 You can use something like cornstarch, arrowroot, or potato starch instead. Would any of these work? If not, you can omit it altogether — it just helps the ice cream not be “icy” / be creamy. Hi Karen. I think macadamias have a very particular flavor, which will create a different recipe by default. 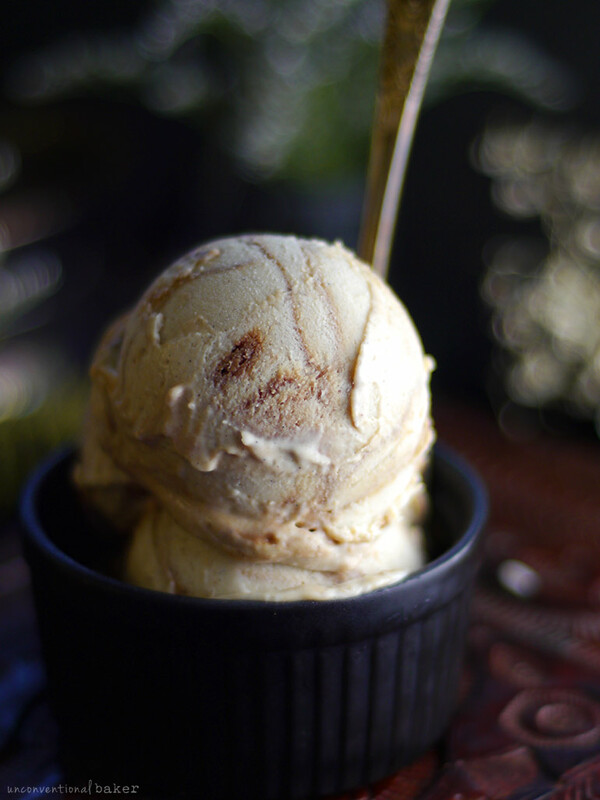 You can use this as a base to guide you though and alter it to a macadamia-based ice cream. From my experience, when you swap cashews for macadamia in a recipe like this, you’ll need to use more sweetener and adjust the flavors slightly to your liking. I don’t think the macadamia oil will work in the same way unfortunately though, as it doesn’t freeze solid in quite the same way as coconut oil. You can try cutting it down by switching out some of the coc oil for maca oil for flavor. P.S. 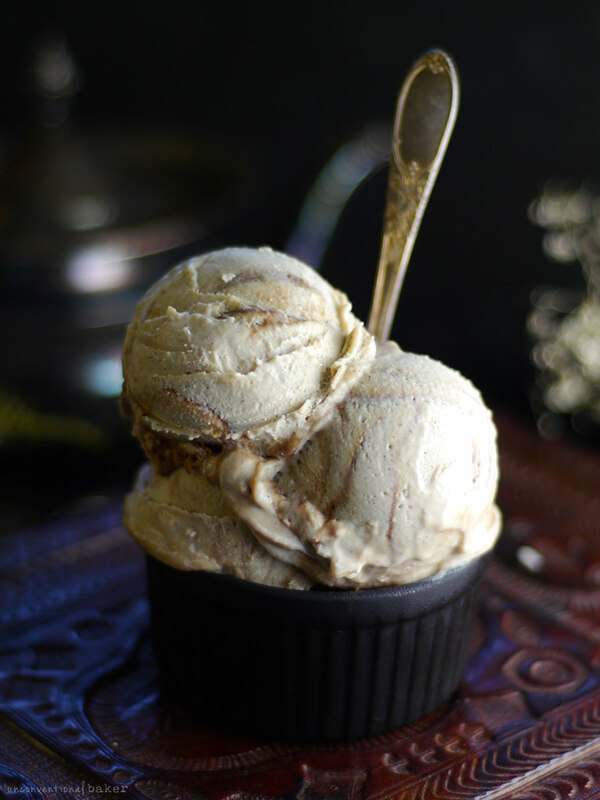 and now you’ve got me craving macadamia ice cream! ? I can’t wait to try this! 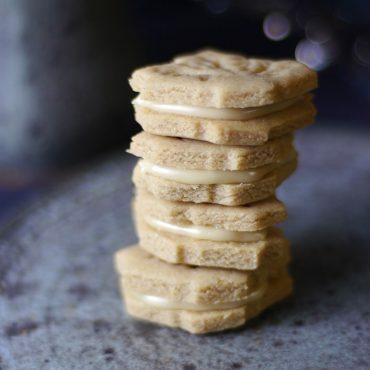 Please can you recommend where to buy Raw Vanilla Bean powder? ? Hi Sam. Thanks ?. I buy mine at a local health food shop usually (more affordable), or on iherb.com or amazon. This is the brand I buy online usually: Wilderness Poets. P.S. I have a mini resources page here if you’re curious about some of the products I use frequently in my recipes. My gosh Audrey, your swirl, the frosty surface, the recipe itself and the photographs — all so perfect! Well done my friend. No wonder this recipe is being shared so much! Love from DC! There’s a standard raw dessert procedure of working with raw nuts that are pre-soaked. To pre-soak them you need to soak them in room temp water for 4 hours (to get the most nutritional benefits of them and to keep the recipe raw). Alternatively, if you don’t need the recipe to keep “raw”, you can also do a quick soak if you prefer by covering them in freshly boiled water and letting them sit for 15 mins. In both cases the objective is to re-hydrate, soften, and plump up the nuts so that they blend into a smooth consistency. And in both cases you strain and discard the water at the end and just use the nuts. Is it ok if I leave out the tapioca powder? Or could I substitute it with cornstarch? Hi Kitty, corn starch should work fine as a substitute. It helps with the consistency. That sounds delicious, Barbara! :) I was dreaming up all kinds of versions myself with raspberry swirls, or choc chips, etc. Glad you liked it. I’ll hop on insta later today and will be sure to have a look. Thank you for sharing! I’m not vegan, but nonetheless this ice cream looks incredible. And sounds wonderful. Such beautiful photos – and Iknow how hard it is to photograph ice cream! Thank you Mimi — so happy you like it :) And gosh, photographing ice cream can definitely be a challenge… doesn’t help that I’m typically also terrible at scooping the ice cream gracefully — luckily this one was a breeze to work with in that regard ? That sounds sooo good! I will try it this weekend. I know I’ll love it and I bet my non vegan family & grandchildren will also!